"Dub For The Radicals" are ten unearthed rock solid Roots Radics rhythm tracks dub charged by Alborosie and Flabba Holt at Shengen Studio, Jamaica. 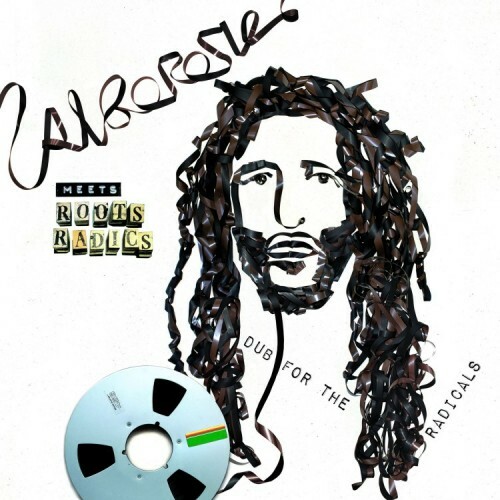 This is speaker shaking drum and bass from the original Roots Radics - pure dub fire - Alborosie meets The Roots Radics at their best in a heavyweight dub showdown! Available as CD in a 6-panel digipak and as LP-Vinyl. It is Alborosie's fifth dub project following the strictly dubwise albums "Dub Clash" (2010), "Dub The System" (2013), "Dub Of Thrones" w/King Jammy (2015) and "Freedom In Dub" (2017). Albrosie is the singer, songwriter, deejay, engineer, producer and multi-instrumentalist - and contemporary reggae star. Born Alberto D'Ascola in Marsala, Sicily on July 4, 1977, the son of a retired police officer, Alborosie taught himself to play guitar, bass, drums, and piano! The Roots Radics Band was formed in 1978 by bass player Errol "Flabba" Holt, guitarist Eric "Bingy Bunny" Lamont and drummer Lincoln "Style" Scott. They were joined by a few more musicians over the course of time including guitarist Noel "Sowell" Bailey, Dwight Pinkney and Steve Golding, keyboard player Wycliffe "Steelie" Johnson (later a part of Steely & Clevie), Pianist Gladstone "Gladdy" Anderson, saxophonist Headley Bennett and percussionist Bongo Herman. As a combined force the Roots Radics became a well-respected studio and stage band, which dominated the sound in the late 1970ies and first half of the 1980s. They recorded for several producers including Henry "Junjo" Lawes, Linval Thompson, Joe Gibbs, Niney The Observer and as well played a crucial part in the evolution of Dub Reggae with a huge amount of their music was mixed by Overton "Scientist" Brown. The most known artists backed by the Roots Radics, both live and in the studio, include Bunny Wailer, Gregory Isaacs, Israel Vibration, Barrington Levy, Eek-A-Mouse, Johnny Osbourne, Prince Far I, Yellowman and many many more. Style Scott later co-founded Dub Syndicate alongside Adrian Sherwood (On-U Sound).